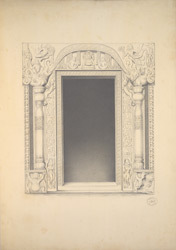 Pencil drawing of the shrine doorway on the lower storey of Cave 6 at Ajanta, from an Album of 26 ground plans of the Ajanta caves and 16 folios of drawings of sculpture and architectural details in the Ajanta caves, by Capt. R. Gill, dated c.1850. excavated between the second - first centuries BC; then, after a period of more than six centuries, the excavations restarted around the fifth century AD, in the Vakataka period. Cave 6 was excavated in the late fifth century on two levels. This drawing depicts the doorway of the shrine of the lower level. An ornamental arch springing from opened-mouthed makaras, aquatic monsters, is carved at the top of the pilastered jambs. Figure of the river goddesses and elaborate scrollwork flank the door jambs.